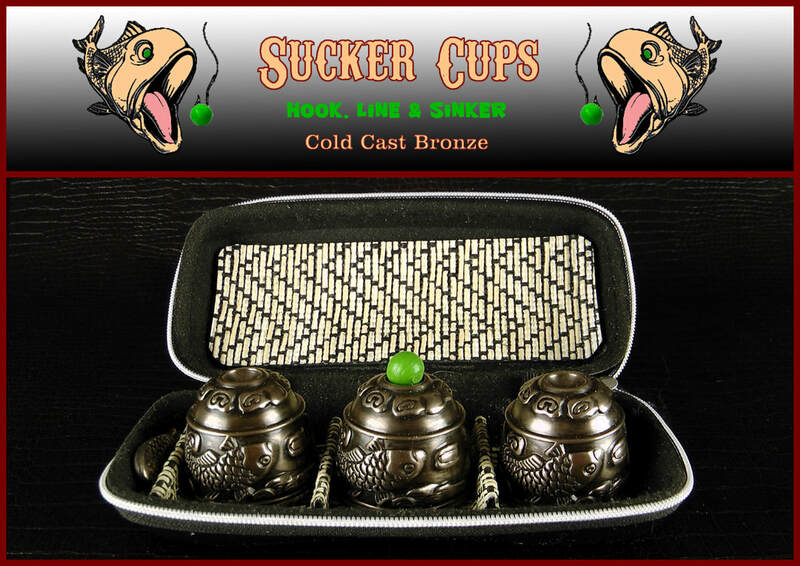 The set is called "Sucker Cups" as the carvings on the cups are of a sucker fish looking to take the bait. The fish on the cup represents the "player" and the bait is the ball. This set brings unlimited ways to bait your hook to catch any fish playing the game. 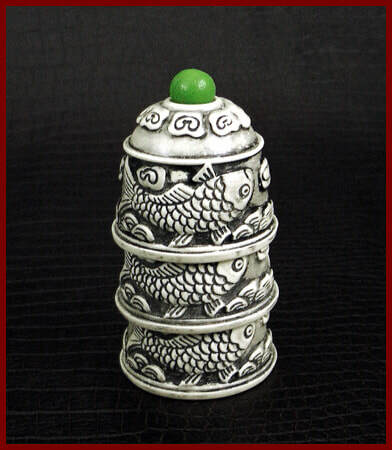 The object of the game is for the player to pick the correct fish cup that has the bait to win. This set is made of a off white resin, with a black stain rubbed in the finish. 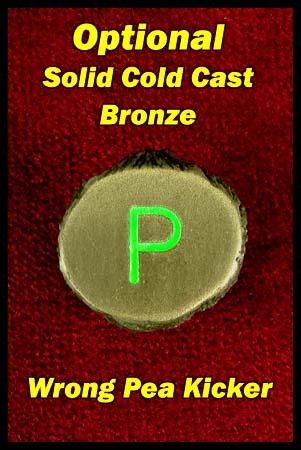 ​The set is also available in cold cast bronze. This set looks like small carved ivory vintage cups. 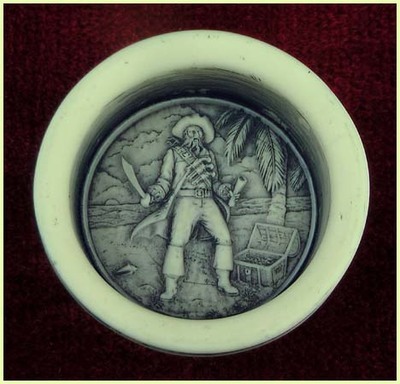 The set comes with a player's fish cup picker for the player to place in front of the cup that they think has the bait. This adds some hands on fun for the player and the others watching will always know the cup that the player has picked. 4 each 3/8" or 7/16" soft bait balls. Standard 3/8", color green or you can request other colors and size. Also, if working with our metal blended balls "sweet peas" and the M-snatcher or PK ring you are able to do some amazing things. The cups can also work with a cork ball, where the cork ball will stay inside the cup when the cups are moved around on the surface with the ball. This makes it a fair game and everything can be fully examined at anytime without switching anything out. But you have full control to change the game to an unfair game any time you choose for the win. 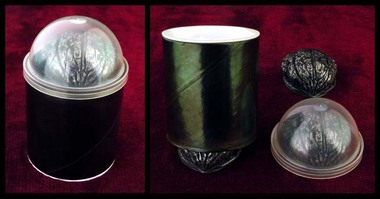 This is a professional cup set for displaying the three shell game. You will always have a no-limit on catching the fish. 4 divided fitted cushion sections for three cups and player fish cup picker. Inside top of the case has fabric covered cushion to hold everything in place when the case is closed. Top of the cup can hold one ball and nest another cup. Cup bottom base diameter - 1-3/4"
This set is made of cold cast bronze. 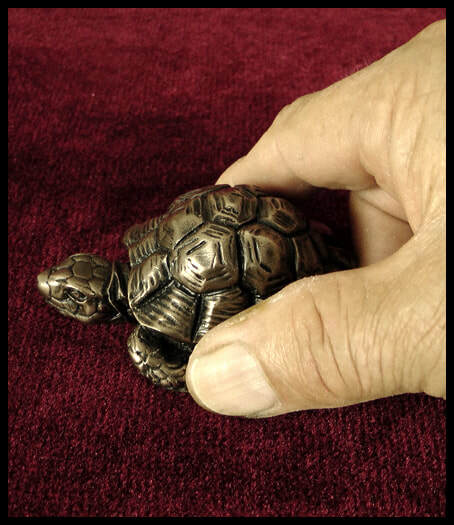 This turtle is a realistic hand sculptured shell that the mold was made from. Each shell is made by doing a two step casting. The first step is applying a cold cast bronze exterior layer, then the interior is made of black resin. The second step bonds both materials together as one. This brings the right weight and a good contrasting color match. The shell weight is about 50 grams. The shells are very easy to grip. 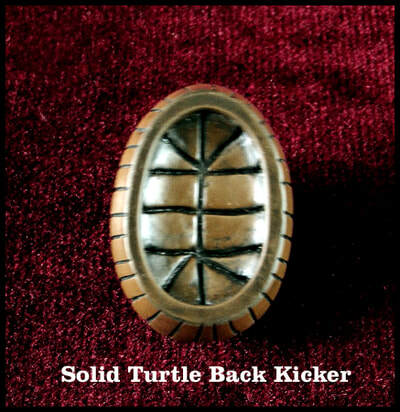 The fingers fit very well between the turtle legs and the bottom edge of the turtle shell. 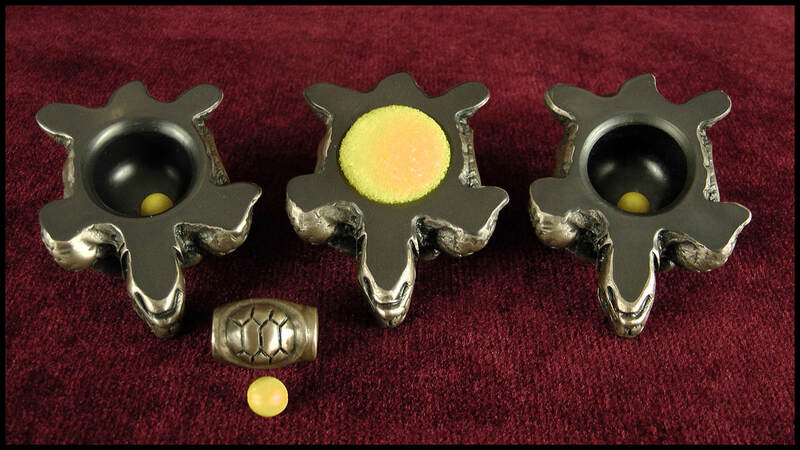 The set comes with a bronze turtle shell ball holder that holds three 3/8" yellow turtle eggs. Also comes with a 1" yellow sponge ball that can be used for an added surprise if you like. The sponge ball can be loaded into a shell when turning a shell back over on the surface and the shell can even be re-lifted without the ball falling out to appear to be an empty shell. The shell can also be moved without the sponge ball coming out. ​To produce the ball you just lift the shell with a little wiggle on the surface. 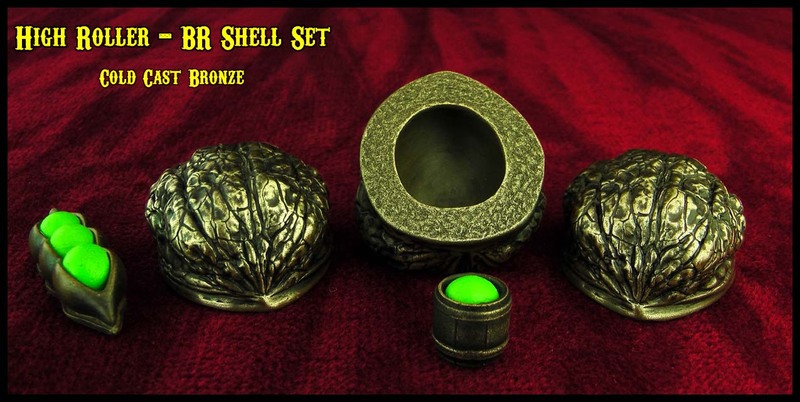 This is a beautiful shell set! Inside top of case has leather covered foam cushion to hold everything in place when case is closed. ​This shell has some unique design features. The sure rim grip is elevated 5/16" from the surface to have a solid grip on a shell for good shell control. The bottom of the shell has an inner & outer bottom rim tapper, for smooth ball steals & loads. The inside of the shell has equal headspace in all areas of the shell, so the ball will never touches the top wall of the shell. This means the ball can be anywhere in the shell when releasing the shell and there will never be any movement of the shell. This interior shell design brings the feature that the shells can also work with a cork ball. ​The use of the cork ball was how the shell game was originally done without the use of any shills in play. Which is how the magician must play, without any shills in play. When using a cork ball with these type shells the game is now a unpredictable game for even the one that knows how the shell game is done. Because the cork ball will stay inside the shell when the shells are moved around on the surface that makes it a fair game. The only thing that is unfair is the shell operator. The shell operator has full control on when to play fair to setup the con and when to play unfair to win. Also, everything can be fully examined at anytime without switching anything out. ​The use of a cork ball with the shells does require a little different type handling than working with with a soft ball. 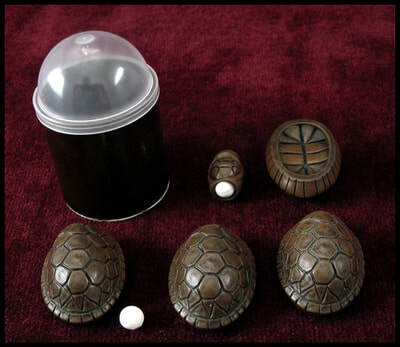 The set comes with three soft white turtle egg balls and a ​turtle shell three ball holder. 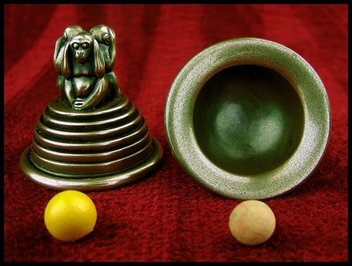 The third ball is in the center of the holder and the center ball can be taken out by blowing on one open end of the shell ball holder. 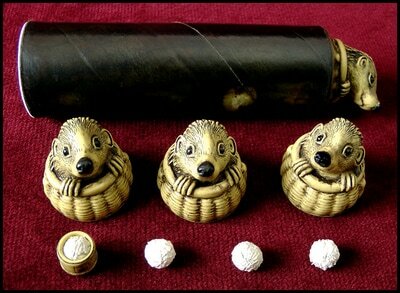 The set also comes with one 3/8" cork ball to try out with the shells. that will require a little different type handling than working with with a soft ball. Shell and ball handling instructions are included with purchase. The whole set fits in a custom hard tube case with a plastic dome cap. 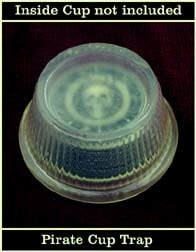 ​The plastic dome case cap can work a perfect fit shell trap for your shell routine finish. A nice working shell set and a good set for the shell collectors! ​These shells are shaped like little bells without the ringer. 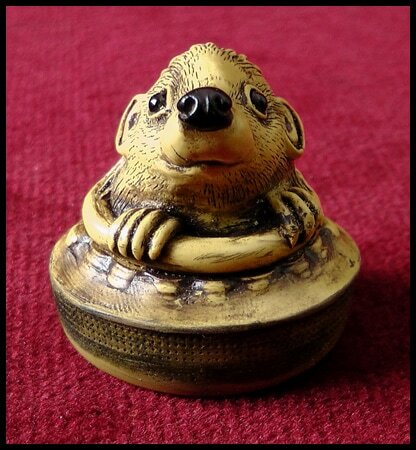 Has three detail see no evil, hear no evil and speak no evil monkeys as the bell handle. Made of cold cast bronze that brings a beautiful vintage look and some good working weight to them. The entire bottom rim of the shell has a nice taper that makes them look like the inside of a little bell and helps to bring a smooth ball steal. The set comes with softballs and hard cork balls. If the shells are used with the softballs the mechanics of how the shells work are the same as today's modern type shells. The shells were designed to be able to take your game even further than the modern day shell game. Can be presented the original way the shell game was played. 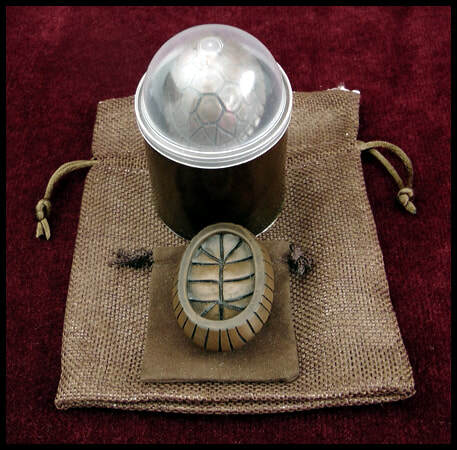 With the use of a harder type ball, like a cork ball, all the items being used becomes fair play to set up the con. The only unfair thing in use is the shell operator. The cork ball will stay inside the shell when the shell is moved around on the surface. But you can steal the cork ball anytime you choose too. You are never forced to take the ball at any time when you move the shell. This is a big advantage. This makes it an unpredictable shell game. Because you have full control of when to play fair or unfair. Everything can be fully examined at any time, why not, if there is nothing to hide. Some have tried to convince the spectator by switching out the softball for a hard plastic ball to appear to be the same to let them examine everything. But in most cases, this can make it worse. Even if the two match fairly well, there is now a sound problem from the hard plastic ball hitting the shell wall. You don't have this problem with a cork ball. The cork ball is lighter and softer and will not bring the sound problem to know what shell has the ball. Doing the shell game with a cork ball is all done by sleight-of-hand, so it is not as easy as with the use of a softball. It requires some training of your memory muscles to finger clip a harder ball with light finger pressure to hold the ball and still move your hand in a relaxed way. The ones that I think learn easier to finger clip a cork ball correctly, are magicians that have performed sleight-of-hand with coins. The memory muscles already have some training with finger clipping a hard item with a relaxed hand. I feel it is well worth the practice. Custom shell trap that has a perfect fit to the shell bell. ​Can work well for your ending surprise with a softball or a cork ball. 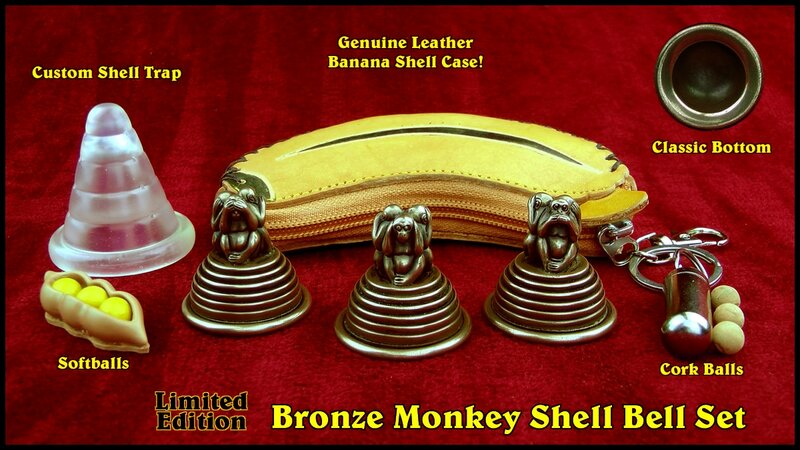 Leather Banana Shell Set Case: This is a very handy case, 5" x 2", handmade of high quality. The case can be attached to your belt loop and has a ball holder on the key ring. Everything fits very well inside, with a little extra room to carry a small polishing cloth. 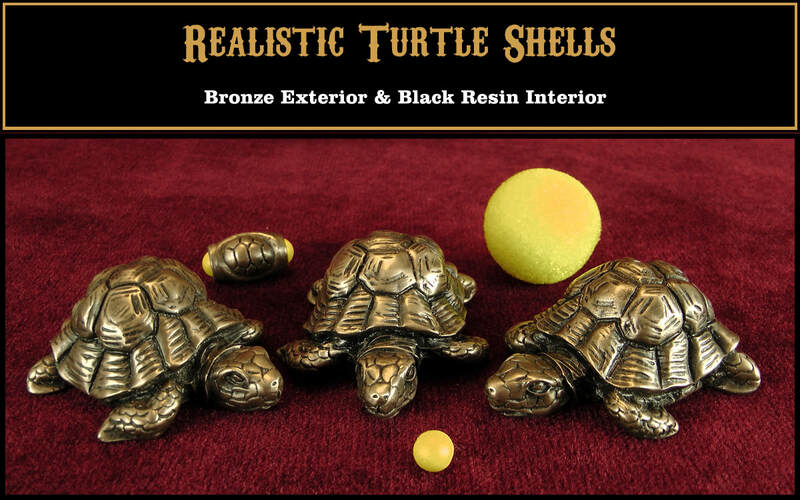 ​To keep your shells always looking their best. Also, has a zipper. ​This shell set is a Limited Edition because I only have a small number of these handmade special cases! The 3 Buck Shells are great handling shells that have good height and width. ​These are well shaped beautiful,walnut shells. Easy to grip and are able to hold six half dollar coins. It will bring an amazing effect when the spectators see six large half dollar coins falling out of a walnut shell. The player will miss out on the three buck payoff when they pick the wrong shell for their game-ending surprise! 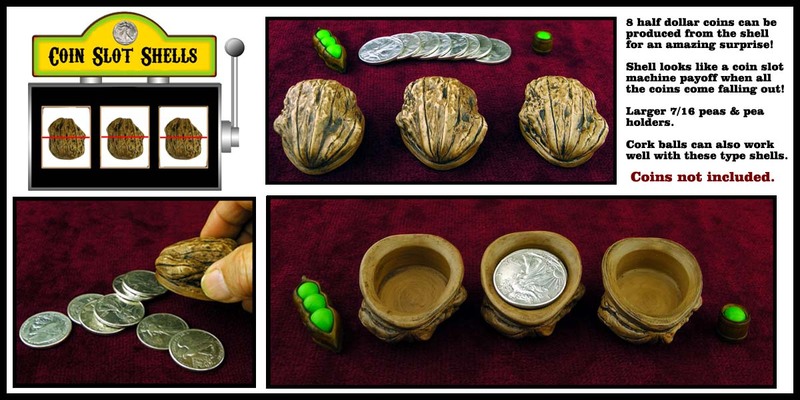 Money coming out of a walnut shell works well as the shell game is known as a gambling game trying to win money. The coins falling out of a walnut shell is very visual and with sound. Shell Set Tube Case: Carries all three shells with a pea in barrel pea holder. 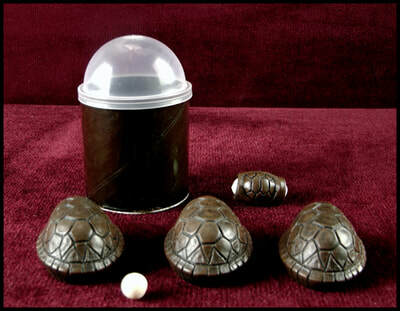 Everything you will need, to play the shell game in a compact 2" diameter x 3-1/4" high container. The six half dollar coins can be taken from your pocket when the timing is right for you. 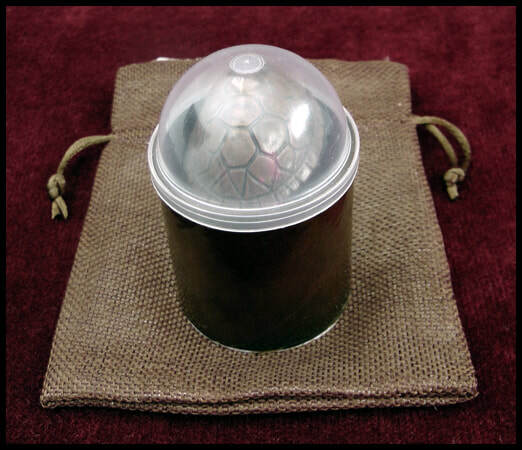 The tube case and the clear dome lid can also be used as two shell traps. This works very well where the tube case and lid are items that are more impromptu being used that are not special items. This case and lid can work well for the ones that like doing something simpler to the Ouellet's - Supershell routine. Peas; The set comes with four larger 7/16" KDS green peas and pea holders. These larger type peas are easy to handle. They are softer than other peas on the market and will take shape between the fingers to bring an easy finger clip or back finger clip without popping out from the fingers. Using a larger type pea helps to make the game more visible for the viewing of your shell routine. The shells can also work well with a cork ball if you like. The six coin production from the shell is fairly simple to do. ​The six coins are laying flat on the last three fingers, where the three fingers are curled inward to clip them in the hand. 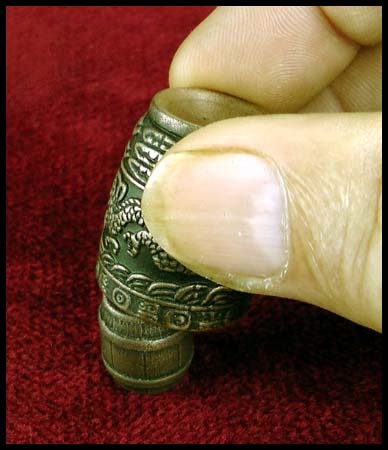 The coins are released from the fingers as soon as the shell is lifted with the forward motion and it will appear that the coins came out of the shell. 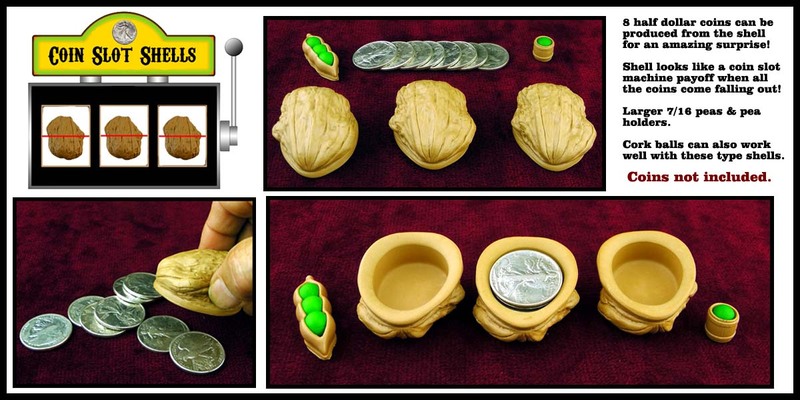 Afterward, the coins can be put inside the shell to confirm that the coins do fit inside the shell. Coins are not included with shell set. Same as the above 3 Buck Shell set but with the vintage finish. 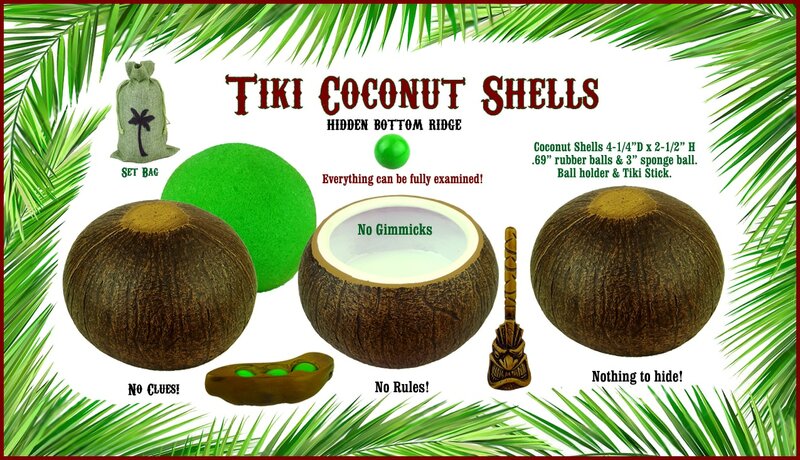 ​The molds were made from a real coconut shell. A coconut shell set where all the shells match and much more. The shells even have an inner white plastic resin core. It is one of the most advanced design shells you will find made today. This shell design has an outer plastic resin core and an inner plastic resin core of two different colors. Having the inner white core brings a very good contrast with the green ball. The inner white core also has what we call a Hidden Bottom Ridge design on the shell. The reason we call it a hidden ridge is because it is not noticeable. ​The bottom ridge is not a gimmick, it is just the opposite. 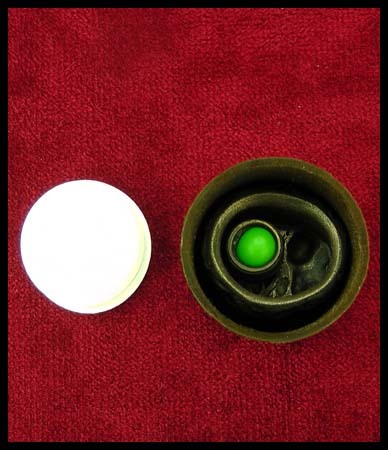 This feature makes them fair shells when using them with a softball, where the ball will stay inside the shell when the shell is moved on the surface. You have full control of when you want to steal the ball. This makes them an unpredictable shell, as you are never forced to take the ball, like all other type shells. This will even fool the ones that are in the know of how the shell game is normally done. There are no gimmicks and everything can be fully examined at any time without switching anything out. The only thing that is unfair is the shell operator and you have full control on when you want to play fair or unfair. 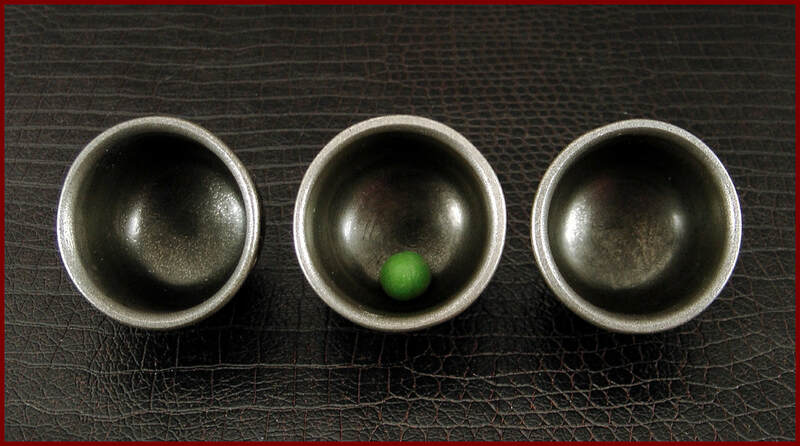 ​The set comes with three .69" soft rubber green working balls. These type balls are very easy to finger clip and control in or out of the hand. Also, comes with a large 3 ball and pea pod ball holder. ​For a fun ending surprise, a 3" super soft sponge ball comes with the set that can be loaded into a shell and will stay inside the shell when the shell is held up off the surface to appear to be an empty shell. You can even move the shell on the surface without the sponge ball coming out of the shell. ​The Tiki Stick can bring some hands on fun for the spectator to feel more involved in the game by them using it to place in front of the shell for their pick. The Tiki stick can also work as a magical effect for the ending surprise where after the player places the Tiki stick in front of their shell pick the operator takes the Tiki stick and taps on another shell to transfer the ball to another shell. When the player picks up the shell they picked the ball is gone. The shell that was tapped with the Tiki stick is lifted and it now has a 3" green sponge ball. ​This type set can work well for anyone that wants to have something special for entertaining at a ​luau party or any larger crowds for good viewing. A big shell set where everyone can see the fun. This is a professional shell set that has the natural beauty and handling features that go beyond other shell sets. The bronze brings some good weight to the shell. Each shell weighs about one ounce. These heavier type shells handle very well. Easy to pick up without slipping out of your fingers. This walnut shell is shaped to bring a sure grip. 2-3/4" H x 1-3/4" D. The case is made up of one semi-clear vinyl cap with a plastic inner tube core and another regular vinyl cap that is press onto the cap with the inner tube core. This cushion case will bring maximum protection for your shell set. The two caps fit so well over the shells that both the caps can also work as two shell traps. There is no movement of the shell inside the trap at all when stealing the pea, with the use of these caps as shell traps. 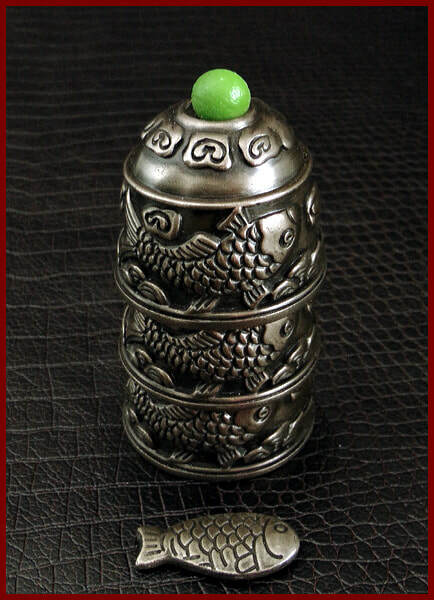 Peas; The set comes with four larger 7/16" KDPS green peas with bronze pea holders. These larger type peas are easy to handle. They are softer than other peas on the market and will take shape between the fingers to bring an easier finger clip or back finger clip without popping out from the fingers. Using a larger type pea helps to make it more visible for the viewing of your shell routine. Bottom Ridge; is a new design shell that brings many features that no other shells have been able to do. The whole set can be fully examined at any time without switching anything out. ​The bottom ridge shells can bring confidence to play the game where they actually can believe they have a fair chance at winning. This is because they are fair shells. The bottom ridge is not a gimmick, it is just the opposite. The ridge never holds or hides the ball in the shell. The ridged bottom works like a ramp to send the softball on an open path where the ball can roll freely inside the shell. ​You are never forced to take the ball. The ball stays inside the shell when the shell is moved on the surface and you have the control to take the ball when you want too. You can even fool the ones that are in the know on how the shell game is normally done with all other type shells. This makes them an unpredictable shell that always appears to be done fairly. The only unfair thing is the operator, that has a choice of when to play fair or not to play fair, at any time. Also, now the softball can be justified as only being used so they can't hear which shell has the ball. The shell has entire flat surface. ​The shells with No Clues, No Rulers or Anything to hide. Think about what makes the lifting of a shell to become noticeable when the ball is forced to exits or enters the classic type shell. What happens is one area of the shell lifts up higher than the other area of the shell when the ball puts pressure on the shell to lift for the ball to exit or enter the shell. The BRS handling can also work well for the classic shells where the shell stays level. To make this lift unnoticeable you don't let the pea lift the shell. You lift the shell a tiny bit in a level way when you steal or load the ball from any type shell. ​This is done by using an equal balance three point grip on the shell to get a slight level lift on the shell between the fingers and ending with a gradual release of the shell to the surface. Also, with our soft type balls, you will have undetected pea steals and pea shell loads. ​Handling instructions of the Bottom Ridge Shells come with PDF file on the handling of shells & pea. Also, link and password to the handling videos after you purchase a set. This set is called our Top Shelf classic shell set for many good reasons. This is a well-shaped shell with a good height that makes them easy to grip. Also with the shell having the good height, the interior of the shell will have the proper space for the ball to roll freely and the shell is able to use larger balls for a better viewing. Most common walnut shells are shaped with a low inward taper from the bottom to the top of the shell. This type shell brings poor handling features with the outside and inside of the shell. 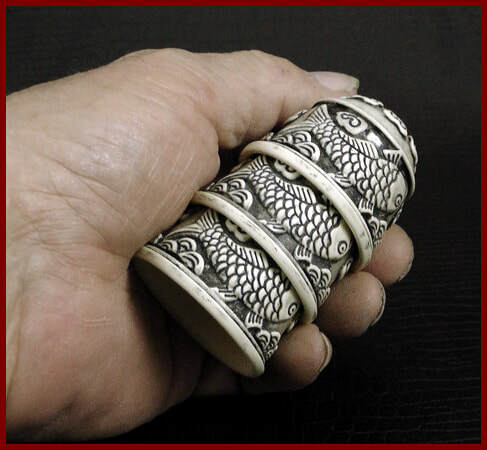 The low inward taper on the outside shape of the shell makes the shell hard to get a good grip, as the fingers will slip upward with the inward taper shape of the shell. This shape will also affect the inside of the shell where the taper is in reverse with an outward taper from the center of the shell to the outer shell wall. What happens is the ball will touch the top of the shell in most cases and put pressure on the shell to start lifting before the ball gets to the shell wall where the ball comes out of the shell. This is not just my opinions, this is common mechanical engineering facts on how it works. A good example of this is if the ball is not in the center of the shell when releasing your hand from the shell, you will see the shell move because it is touching the top of the shell. All of these problems can even be worse if it is a heavy metal shell with this type shape. The shape and weight of this shell have none of the above problems. If you look at the above pictures you will see there is no low inward shape on the shell body. 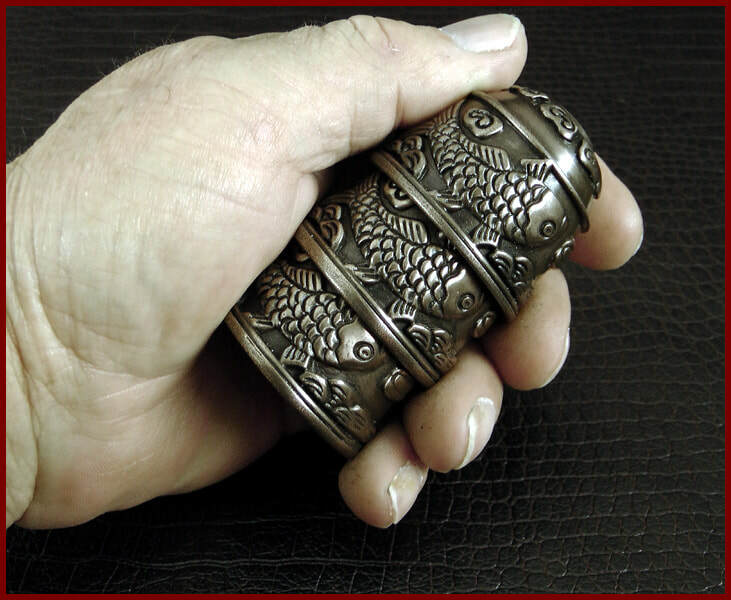 The shell comes straight up for your fingers to grip this heavy shell well. You will also see on the inside of the shell that there is only a taper where it is needed. The taper is only on the shell rim wall, where the ball comes out of the shell. You will also see that the shell has entire flat surface without any notch at the back of the shell. We feel this notch at the back of the shell is just a visual clue on how the ball escapes the shell. Many think they can justify it as a natural hole from where the walnut was broke off from the stem of the tree. No matter how you try to justify it, it is still a visual hole where the ball can be viewed as an escape hole for the pea to come out of the shell. If you look at the above picture without any notch at the back of the shell. The thing is there is actually a tapered notch around the entire rim of the shell that does not stand out as a hole and works even better. As it is like having a notch around the whole shell bottom that blends in as being the shape of the shell with the entire flat surface without any hole. This type shell can even bring all the features that the bottom ridge shells have without the ridge. Where the ball stays inside the shell till you want to take it. This feature applies if the shells are used with a cork ball. This is how the shell game was originally done, where it didn't require to have shill's in play to sell the con. As the shells and cork ball being used were fair. The only unfair thing is the shell operator with the use of sleight-of-hand skills. 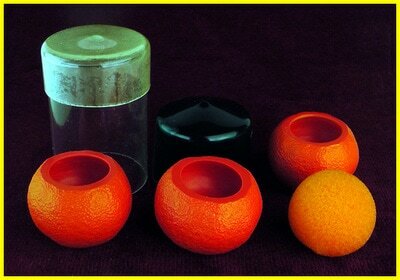 The same handling that is used with the BRS is used when using a cork ball with these non-ridge shells. Using a cork ball takes some practice in training your memory muscles. You want to be able to clip the cork ball with light finger pressure and still hold the ball with the movement of the hand. Shell Set Case: The case can serve many purposes. The whole working shell set fits in a compact case, that only measures 2-3/4" H x 1-3/4" D. The case is made up of one semi-clear vinyl cap with a plastic inner tube core and another regular vinyl cap that is press onto the cap with the inner tube core. This cushion case will bring maximum protection for your shell set. The two caps fit so well over the shells that both the caps can also work as two shell traps. 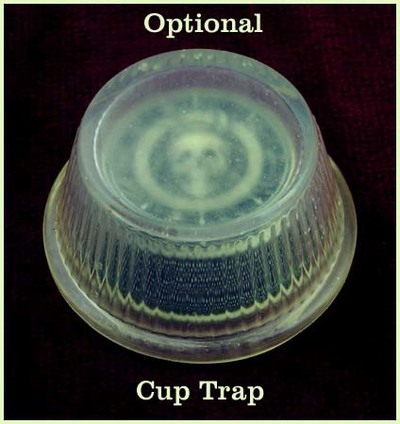 ​There is no movement of the shell inside the trap at all when stealing the pea, with the use of these caps as shell traps. Soft Peas: You will find these peas not only grip the surface well, they grip to the fingers well and the softness of them will take shape between the fingers when clipping them. With the softness of the pea and the weight of the shell, the pea will come in or out of the shell very smoothly. The High Roller - BR is a professional shell set that has the natural beauty and handling features that go beyond other shell sets. The bronze brings some good weight to the shell. Each shell weighs 36 grams. These heavier type shells handle very well. Easy to pick up without slipping out of your fingers. This walnut shell is shaped to bring a sure grip. 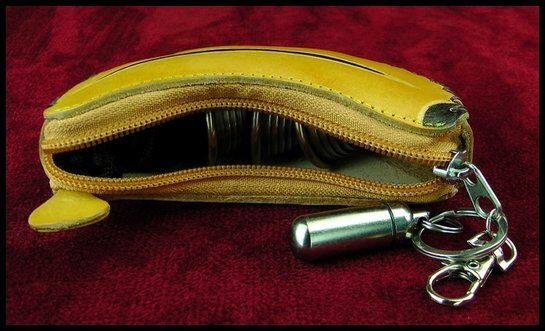 Shell Set Tube Case: Carries all three shells with a pea in barrel pea holder. 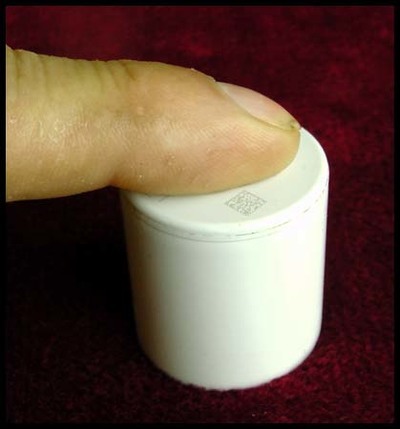 ​Everything you need in a compact 2" diameter x 3-1/4" high container. 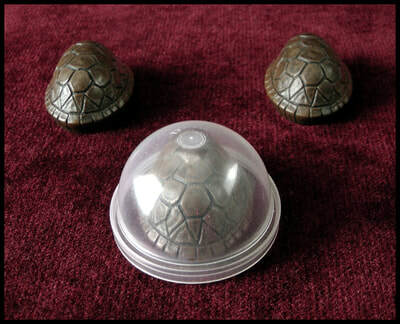 The tube case and the clear dome lid can also be used as two shell traps. This works very well where the tube case and lid are items that are more impromptu being used that are not special items. (see above picture.) This case and lid can work well for the ones that are doing the Ouellet's Supershell routine. 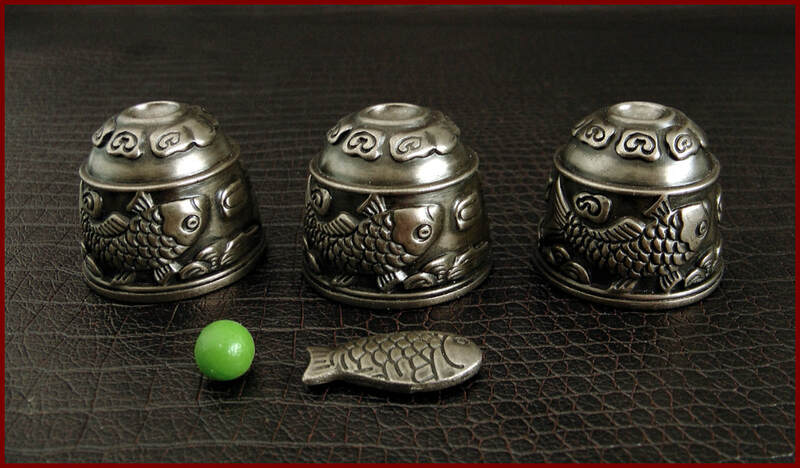 Peas; The set comes with four larger 7/16" KDS green peas and bronze pea holders. These larger type peas are easy to handle. They are softer than other peas on the market and will take shape between the fingers to bring an easier finger clip or back finger clip without popping out from the fingers. Using a larger type pea helps to make it more visible for the viewing of your shell routine. This set is called our High Roller classic shell set for many good reasons. This is a well-shaped shell with a good height that makes them easy to grip. Also with the shell having the good height, the interior of the shell will have the proper space for the ball to roll freely and the shell is able to use larger balls for a better viewing. Most common walnut shells are shaped with a low inward taper from the bottom to the top of the shell. This type shell brings poor handling features with the outside and inside of the shell. 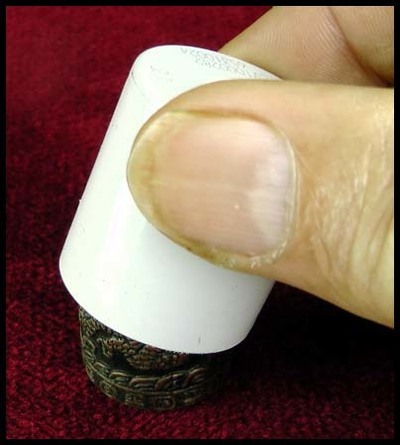 The low inward taper on the outside of the shell makes the shell hard to get a good grip, as the fingers will slip upward with the inward taper of the shell. This shape will also affect the inside of the shell where the taper is in reverse with an outward taper from the center of the shell. What happens is the ball will touch the top of the shell in most cases and put pressure on the shell to start lifting before the ball gets to the shell wall where the ball comes out of the shell. This is not just my opinions, this is common mechanical engineering facts on how it works. A good example of this is if the ball is not in the center of the shell when releasing your hand from the shell, you will see the shell move because it is touching the top of the shell. All of these problems can even be worse if it is a heavy metal shell. No matter how you try to justify it, it is still a visual hole where the ball can escape from the shell that is noticeable. If you look at the above picture without any notch at the back of the shell. The thing is there is actually a tapered notch around the entire rim of the shell that does not stand out as a hole and works even better. This type shell can even bring all the features that the bottom ridge shells have without the ridge. Where the ball stays inside the shell till you want to take it. This feature applies if the shells are used with a cork ball. This is how the shell game was originally done, where it didn't require to have shill's in play to sell the con. As the shells and cork ball being used were fair. The only unfair thing is the shell operator with the use of sleight-of-hand skills. The same handling that is used with the BRS is used with these shells when using a cork ball. Shell Set Tube Case: Carries all three shells with a pea in the barrel pea holder. Everything you need in a compact 2" diameter x 3-1/4" high container. The tube case and the clear dome lid can also be used as two shell traps. ​This works very well where the tube case and lid are items that are more impromptu being used that are not special items. This case and lid can work well for the ones that are doing the Ouellet's ​Supershell routine. ​This set has it all. 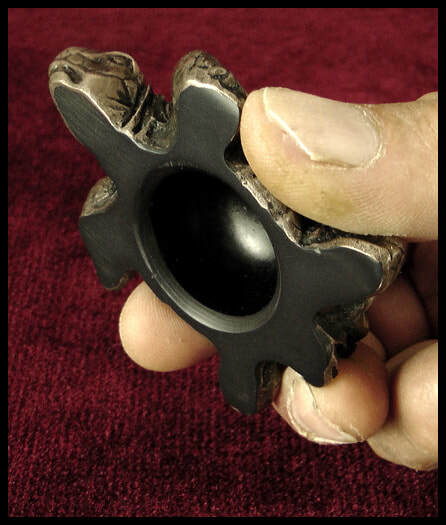 The mold was made from a well shaped real black walnut with no alterations. 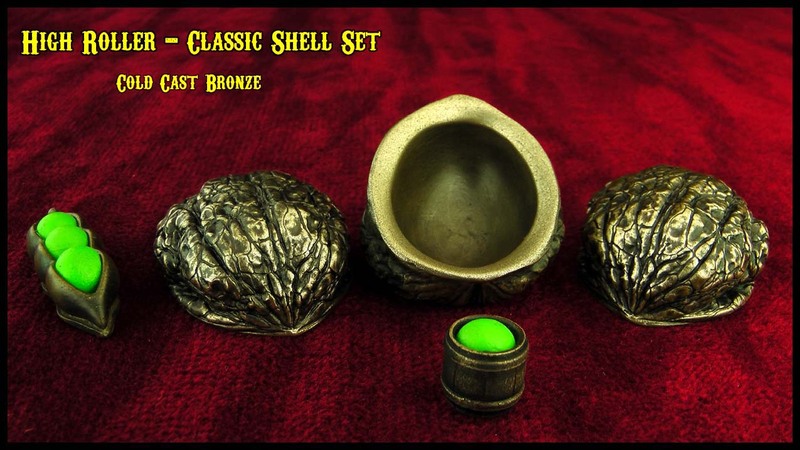 The shells and pea holders are made of a cold cast bronze metal casting. After the shells are cast, the bottom wall rim is tapered to bring a smooth pea steal from the shell. The larger pea working with these shells will bring a very good viewing to your routine. 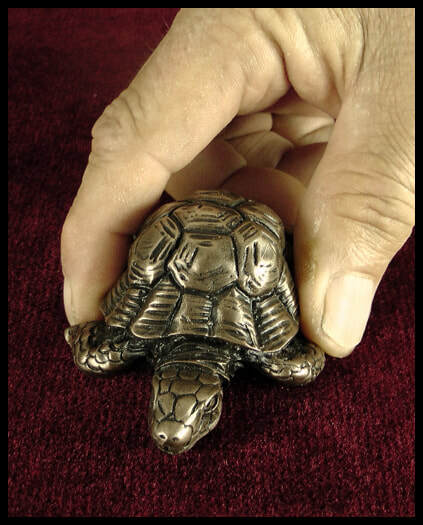 The bronze shell weights 17 grams. Heavy shells that you will never lose a grip on. Looks like a real shell, but works better! ​Shell Set Tube Case: Carries all three shells with a pea in the barrel pea holder. Everything you need in a compact 3"H x 1-5/8" O.S.D. x 1-1/2" I.S.D. in a well-protected container. The tube case and the lid cap can also be used as working props. This works very well where the tube case and lid are items that they have already seen and will appear as impromptu items being used. Here is an example of how a surprise finish could be done. Beginning Setup: An extra pea is finger clipped in your hand that can't be seen and the top cap is taken off the tube case. ​All the items are poured out onto the surface from the case. At the same time, the cap in your other hand puts the cap down out of the play area. 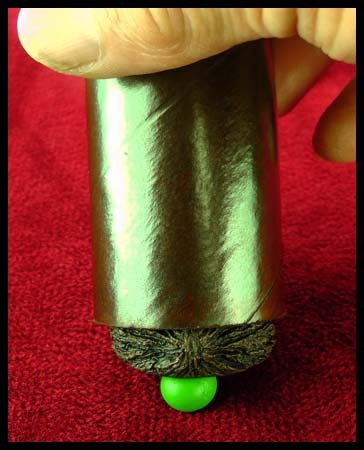 After the cap has been taken off the case the finger clipped pea is loaded inside the cap and held against the cap wall while placing it down on the surface. This beginning setup is now ready for your ending surprise finish. 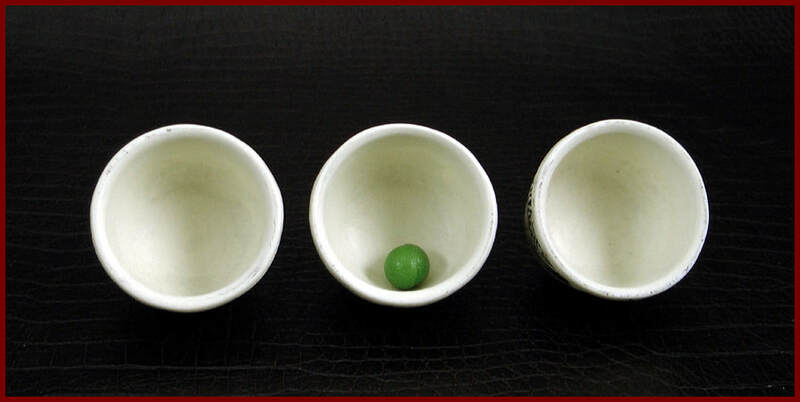 Executing the surprise: With the standard set, all three shells are shown to be empty and the center shell is placed over the pea. You put the tube case over the shell with the pea and move it in front of the player to place their finger on top. The other two shells are picked up and shown to be empty, at the same time your hands will be seem to be empty. Both shells are placed down on the surface and now you try to talk them out of picking the shell that is inside the case that they have their finger on. At this point, it doesn't matter what shell they pick, as none of the shells have the pea. If they pick the shell that is inside the tube case that they have their finger on, you have them lift everything to find that the pea is not there. You give them another chance to pick one of the other two shells and they are wrong again. You then pick-up the last shell to show the pea is not there either and then pick-up the cap to show the pea is always where you lease expect it to be. Executing the surprise with the (optional) - Wrong Pea Solid Kicker: The handling is mostly the same. The only difference, when turning all the shells back over to start a new series of play the center shell is switched out for the solid kicker. This is shown on a video and the switch is done right in front of them. All the other handling is the same as the above. But now when they lift up their shell they find a "P" but it is the wrong type pea, as it is a solid shell with a green P letter on it. The rest goes the same where the pea is under the cap to end. 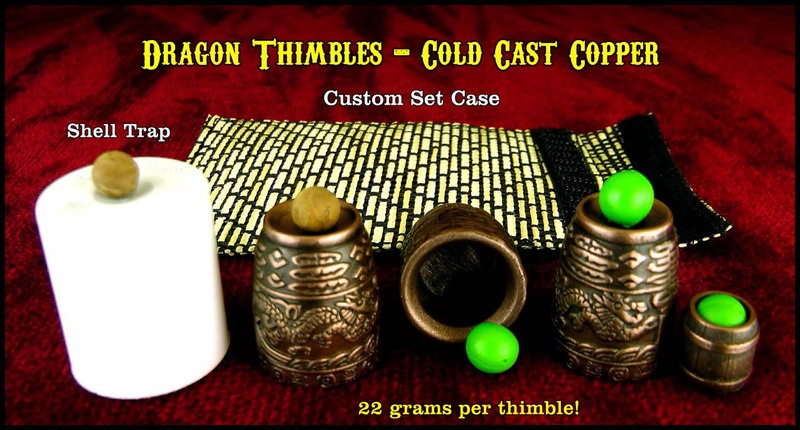 This Thimble-rig set packs small to carry easy and displays big. 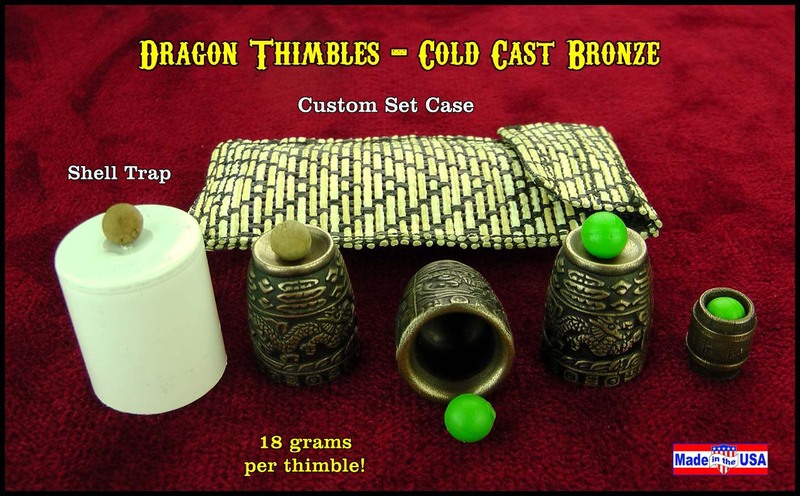 These are cold cast bronze thimbles that have some good weight to them, 18 grams per thimble The set comes with 3/8" soft peas and 5/16" cork balls. 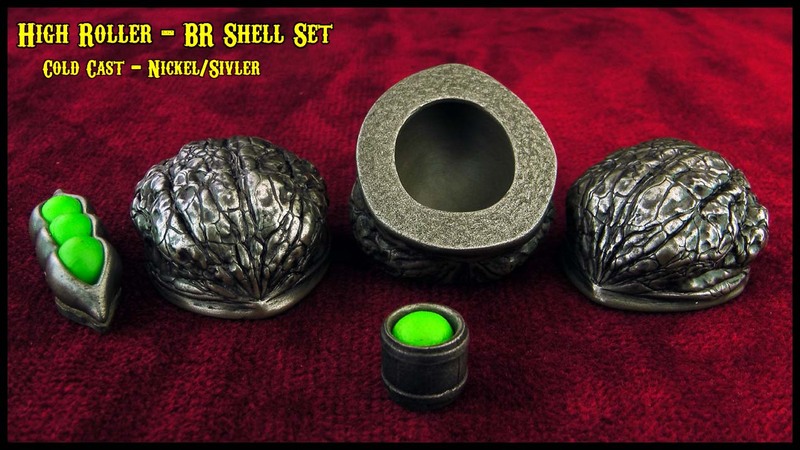 For the ones that want to take the shell game a little farther with the use of a cork ball, this is a good set to work with. 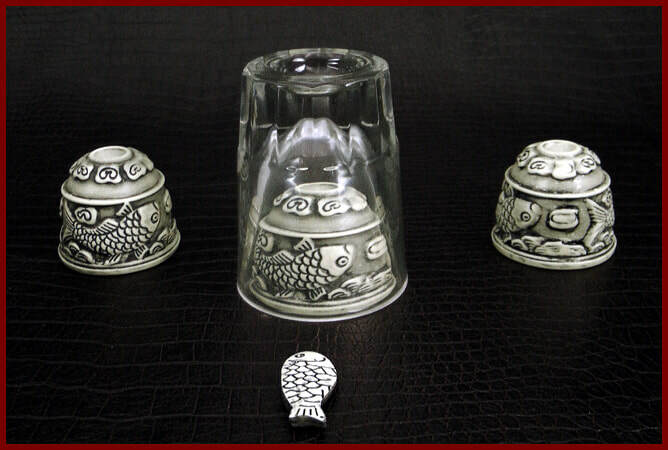 As you can see from the image on the left the thimble has a nice thick wall to put a good taper on the bottom rim to bring an easy soft or hard ball steal from the thimbles. Accessories for an added surprise finish: The barrel single pea holder and plastic thimble trap all fit in the case and if you elect to not do a surprise finish you can just leave the thimble trap in the bottom of the case or leave it out of the case always. Here is an example of an ending surprise. There are many other ways. There are six pictures above in the order of how this is done. The first and last picture are double pictures showing done with a soft pea or a cork ball. Pic.1: The barrel is placed over the ball. 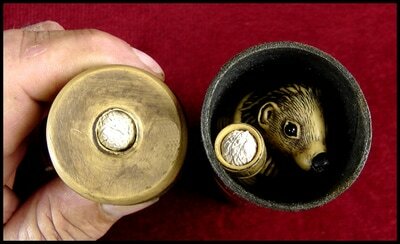 Pic.2: Thimble is placed over the barrel. Pic.3: Thimble Trap is placed over the thimble. Pic.4: All is moved over to the player to place their finger on top of the trap to hold down. The other two thimbles are picked up to show that they are empty and at the same time your hands can be seen to be only holding the thimbles. 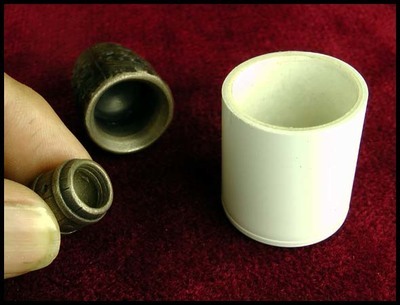 Both the thimbles are placed back down on the surface. Pic.5: The player lifts off the trap, then the thimble and when the player turns the barrel over they find an empty barrel. 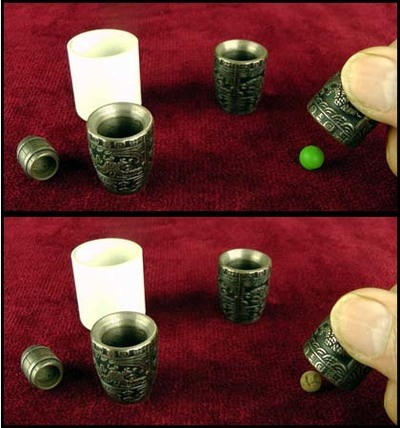 Pic.6: The other thimbles are lifted to see that the pea is now in another thimble. ​"This is a little demonstration on how the three shell game will always bring you an empty barrel and empty pockets." A link and password to the handling videos will be sent my email after you purchase a set. 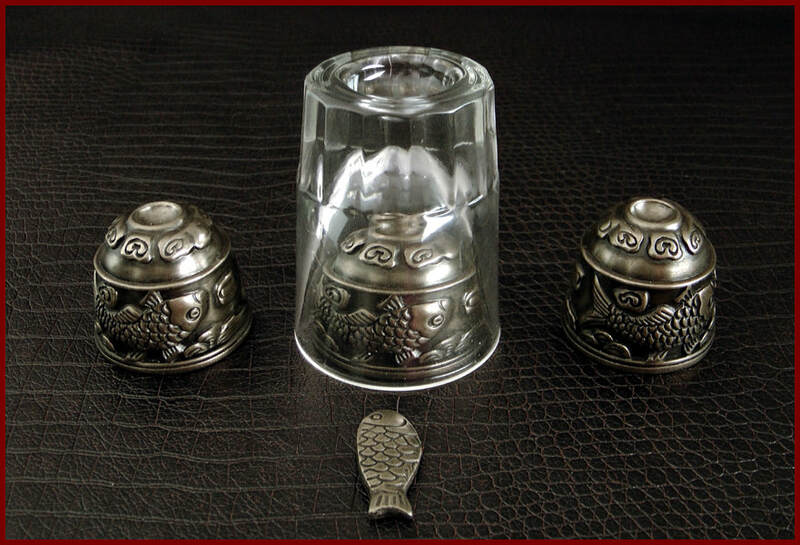 This is the same set of thimbles as above but are made from Copper with a little more weight. ​Many have thought that you will never be able to bring a big surprise load from a little walnut shell like done with the Cups & Balls. This is not the case at all. Actually, it can even be more surprising when seeing large items coming out of a small walnut shell than a larger cup. The Coin Slot Shells were designed to deliver some big surprises with good reasoning behind them and not just fruit or a bigger ball. These shells are able to produce eight half dollar coins. It will be hard for anyone to believe they could all fit inside a walnut shell but they do. A surprise of eight coins coming out of a walnut shell works very well for a good reason. The shell game is known as a gambling game trying to win money. Eight coins falling out of a walnut shell is very visual and with sound. Also with the eight coins being produced at the end of your shell routine, the coins will not only be a surprise but can now be used to go into a coin routine. The eight coin production from the shell is fairly simple to do. The eight coins are laying flat on the last three fingers, where the three fingers are curled inward to clip them in the hand. (As in image #1) The index finger and thumb pick up the shell. ​(As in image #2) The shell is lifted a little up off the surface and moved in a forward motion. (As in image #3) The coins are released from the fingers as soon as the shell is lifted with the forward motion where it will appear that the coins came out of the shell. 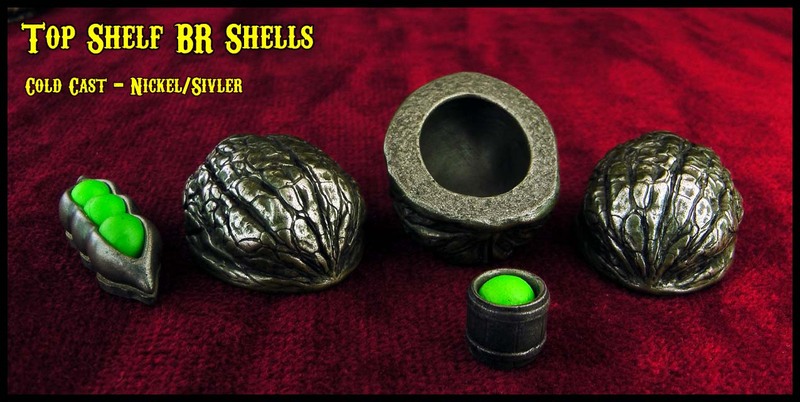 The shells can work with a larger 7/16" soft pea or a 3/8" cork ball. Working with a soft pea the shells work with the classic type shell handling or our recommended handling. When the shells are used with a cork ball you now have full control of the ball where the ball only comes out of the shell when you want it too and everything can be fully examined at any time without switching anything out. The shells is a larger type shell that are very easy to grip and control. Same as the above set - with the vintage finish. 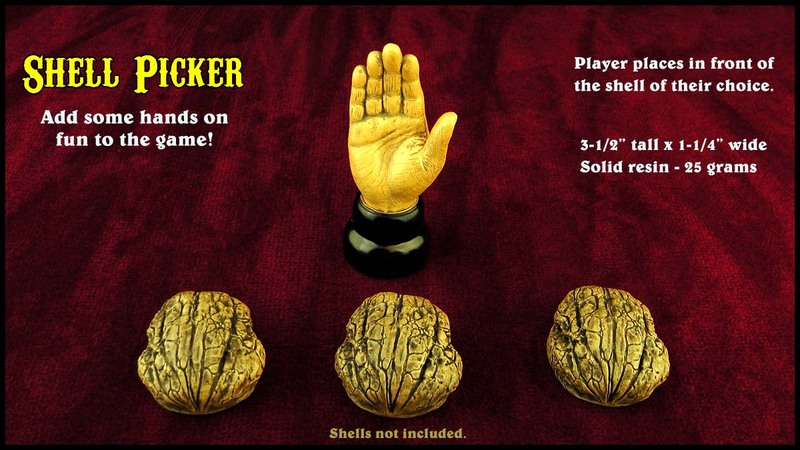 The Shell Picker can bring some added hands-on fun for the player. Also, all of the watching spectators will always be able to see the player's shell pick. This is a very realistic hand with a black sleeve type base. The hand is in a pledge or high five type position as to pledging to their shell pick. Solid plastic resin colored for a vintage look. 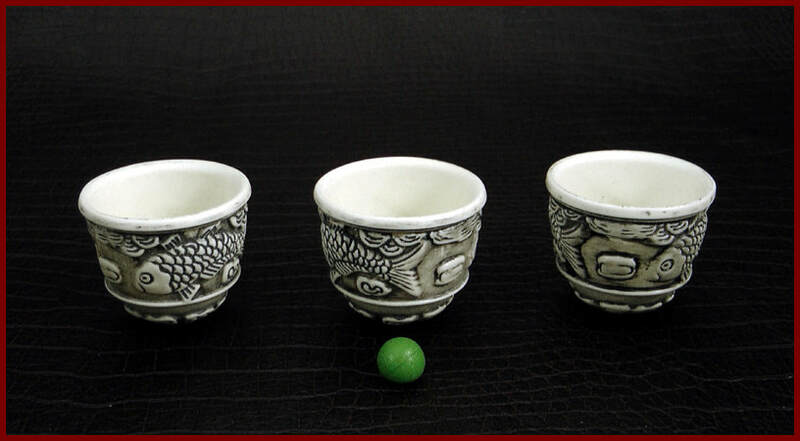 The cups are made with bone color resin and black dye is applied to bring out the fine detail. The art on the outside and inside of the cup is beautiful. 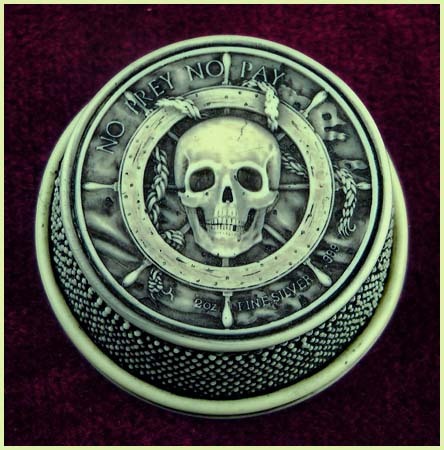 The top of the cup has words that read " No Prey - No Pay". Click on the above pictures to enlarge to see the fine detail. The cups can work with larger balls to be more visual. The set comes with 7/16" red softballs and ball holders. These softballs are easy to finger clip and back finger clip. 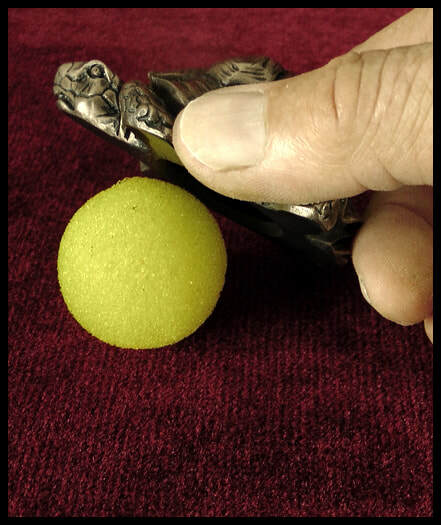 As the softness of the ball will take form between the fingers with light pressure and not pop out from the fingers. The interior design will shock you on how smooth the ball can be stolen from the cup without any use of gimmicks. 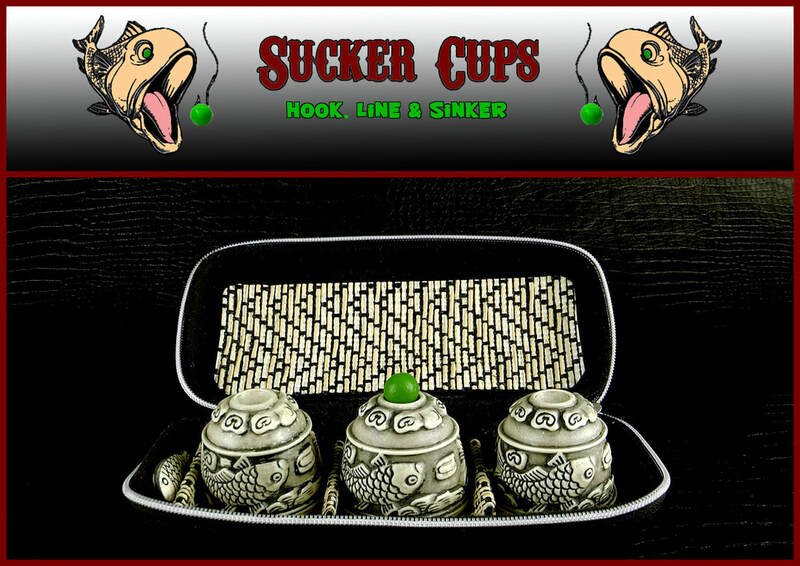 The cups can also work well with a hard 3/8 natural cork ball and still deliver a smooth ball steal from the cup. 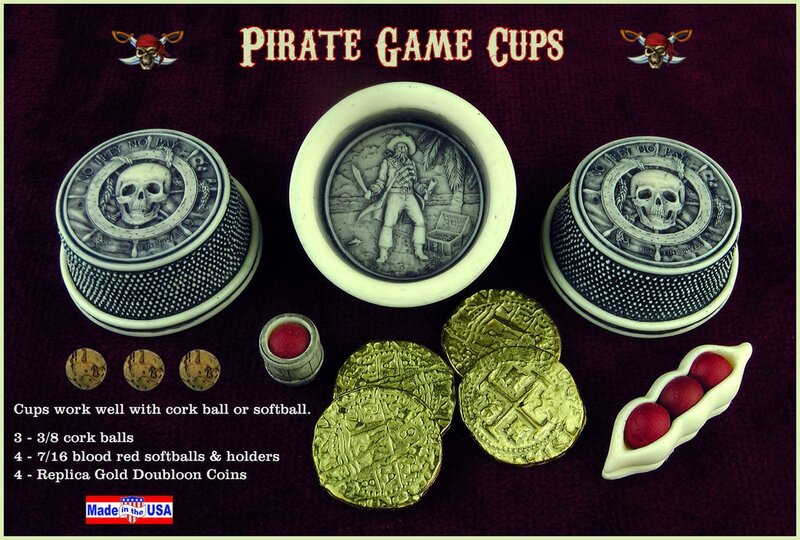 When the cups are used with a cork ball, it brings many added features that can't be done with the normal softball shells or cups. 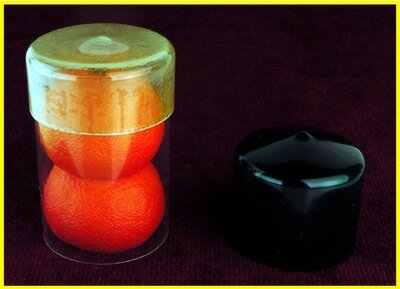 When the cups are used with a cork ball, the ball rolls freely inside the cup. You are never forced to have to take the ball. Only when you choose too. This makes it a fair game to sell the con and get the mark to follow the cup that you want them to follow. At any time everything can even be examined if need be without switching anything out. There are no clues, no rules or anything to hide. This is how the shell game was original done. It appears that there is nothing unfair with the equipment being used and there isn't. The only unfair thing is you the operator. You have full control. At any time you choose you can make it an unfair game to always win when the cups are used with a cork ball. Will even fool the ones that are in the know of how the shell game is normally done. This is because the player can't predict when you make a steal or load another cup. The beauty is once you steal the cork ball and load the ball into another cup, you can now move the newly loaded cup around fairly without the ball coming out. This is a big advantage. 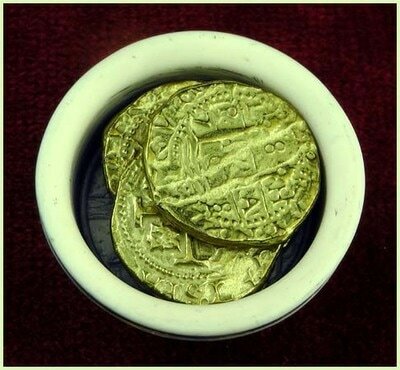 The set comes with four pirate coins that are replicas of Spanish and Portuguese hand-struck Gold Escudo, minted between 1651 to 1773. The coins are 1.25' diameter. These are top quality coins. The coins can be used for the player bets or used for a four coin production from the cup for a surprise finish. So what is a hedgehog? 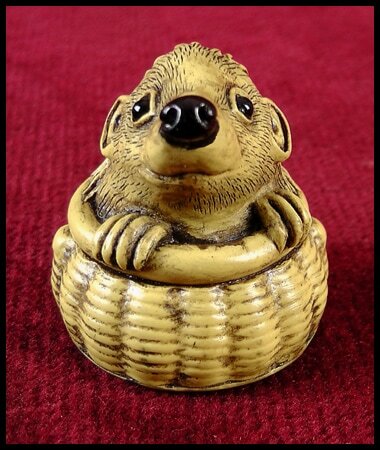 It is a small nocturnal old world mammal with a spiny coat and short legs, able to roll itself into a ball. They are getting popular for pets today. A curious type creature that is entertained by crawling into items. 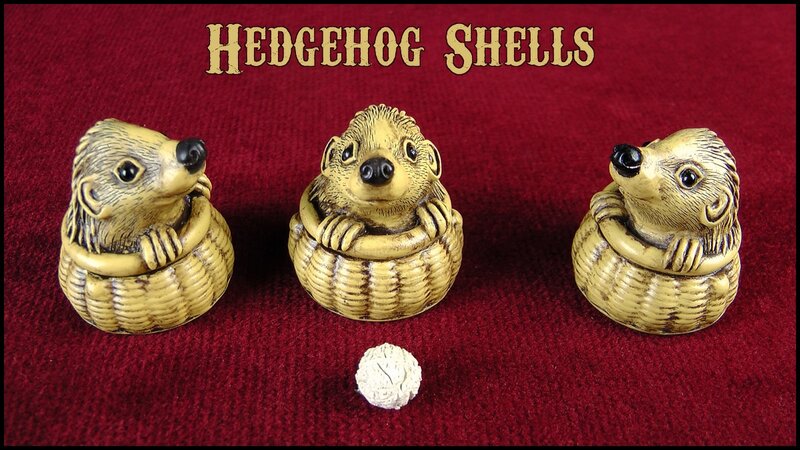 Like the shell set of 3 Hedgehogs in the shells. If you look at the inside of the shell, you will see the bottom of the Hedgehog is rolled up into a ball and its head out of the top of the shell. ​The picture to the left is a baby Hedgehog that is rolled up into a ball. 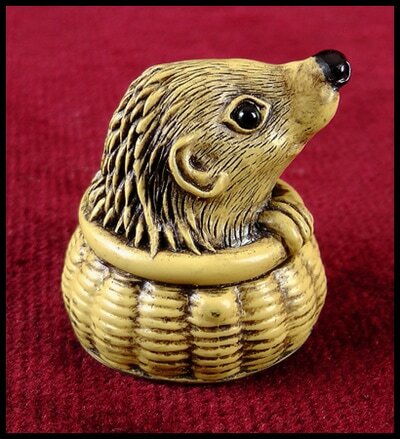 The object of the game is for the spectator to keep track on which shell has the baby Hedgehog that is the ball. The set comes with four larger 7/16" white soft textured balls. The white textured ball represents a baby hedgehog that is rolled up in a ball. The use of a softball working with the bottom ridge type shell brings a whole different meaning for using a softball. Only for the reason of not bringing any sound for the player to hear which shell has the ball. Unlike other shells, everything can be fully examined at any time without switching anything out. As the only unfair thing is the operator, not the items being used. The shells have the new bottom ridge design. This brings many features that will even fool the ones that are in the know of how the shell game is normally done. This new design brings full control of the ball. You are never forced to take the ball. The shell with the ball can be moved around on the surface fairly without the ball coming out. This is a big feature, as you are able to show that the ball is where it should be by lifting the shells during the shuffle to get them to follow the shell you want them to follow. Once they see that everything looks fair you steal the ball after the shell had just been showed to have the ball. Then the ball is loaded into another shell after you just showed it to be an empty shell. The great thing is now after loading a different shell all the shells can be moved fairly without the ball coming out, unlike other shells. ​This makes them an unpredictable shell. The solid hedgehog tube cap can also hold a hidden extra ball. This can come in handy for the ones that want to do something creative with their shell routine. Off white plastic resin with applied black dye. What the Hidden Bottom Ridge design shell brings to the table for the 3 shell game. It gives the shell operator full control of the ball inside the shell. The shell operator is never forced to take the ball. This makes it an unpredictable shell. You can even fool the ones that are in the know of how the standard shell game is done. As no one can predict when you steal or load the ball from the shell. The Hidden Bottom Ridge feature gives the ball a free rolling path inside the shell. But you can steal the ball anytime you choose too. This is not a gimmick. It is just the opposite, it makes it a fair shell to sell the con of the game. The hidden ridge never holds or hides the ball in the shell. The softball is looked on as being used for a different reason. Only for not bringing any sound inside the shell. Everything can even be fully examined without switching anything out. ​The only type shell with no clues, no rules and nothing to hide. The shells are easy to grip and control. The shell set can work well for larger type crowds, as the shell is 2" diameter x 1-1/2" high and the bright orange color makes the shells very easy to see from a distance. 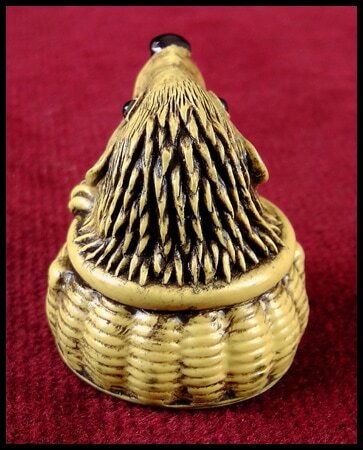 The set comes with larger type yellow 7/16" seed balls that also stand out with a good contrast to the shells. 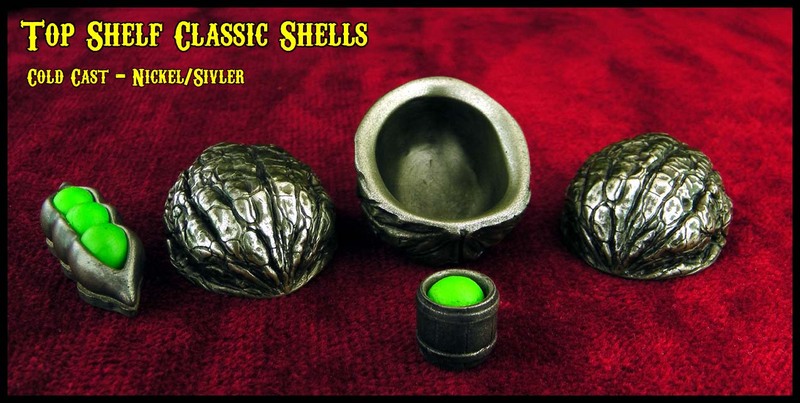 The shells can work well with even larger balls, like 1/2" or 9/16" working for large crowds. The softballs are one of best balls you will find to work the shell game. The softness of this type ball brings smoother ball steals and will form to the fingers for easy ball control with your fingers. ​The shells have an entirely flat surface that has no visual clues. Another cool feature with these type shells, after you steal the ball from one shell and then load the ball into another shell the newly loaded shell can be moved around fairly on the surface without the ball coming out. 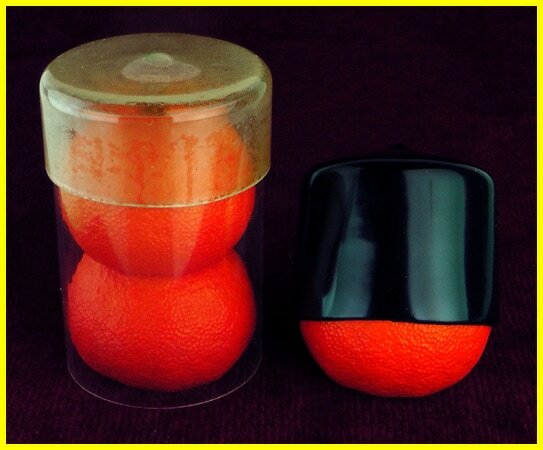 The set comes with a 1-1/2" orange sponge ball for a surprise finish, where the seed grows into the inside fruit of a Mandarin. 2” w X 1-1/2” H 1 oz. per shell. Hidden Bottom Ridge type shell. ​The set carry case was designed to bring many features; Compact case 4" H x 2" D. Transparent to always know whats inside. Sized for everything to have a good cushion fit. The case and cap can also work as two shell traps.